This name uses Eastern Slavic naming customs; the patronymic is Igorevich and the family name is Grischuk. Alexander Igorevich Grischuk (Russian: Алекса́ндр И́горевич Грищу́к; born October 31, 1983) is a Russian chess grandmaster. He was Russian champion in 2009. He is also a three-time World Blitz Chess Champion (in 2006, 2012 and 2015). He has competed at four Candidate's Tournaments: in 2007, 2011 (when he reached the final), 2013, and 2018. He also reached the semifinals of the 2000 FIDE World Championship. Grischuk has won two team gold medals, three team silvers, a team bronze, and an individual bronze medal at Chess Olympiads. He also holds three team gold medals, one team silver and individual gold, two silver and one bronze from the World Team Chess Championship. 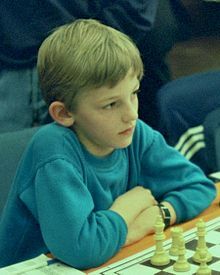 In 1996, Grischuk finished in 21st place in the Boys Under-14 section of the World Youth Festival and tied for third place in the same section of the Disney Rapid Chess Championships. By January 1998 Grischuk had become a FIDE Master, finished 24th in the Moscow leg of the Russian Cup with 6/9, and finished 18th at Nizhnij Novgorod. He finished 44th in his first Russian Chess Championship, scoring 5/11 points, and was International Master and rating favourite when he tied for 8th place at the Boys Under 16 section of the World Youth Championships. In January 1999, Grischuk tied for 13th at the Hotel Anibal Open, defeating third seed Artashes Minasian in the third round. He started strongly at the Hotel Ubeda Open but slipped to tie for 7th place with 6.5/10. At Bled Open in March he finished 9th with 6/9 and at the Biel MTO Open in July finished 11th with 7/10. At the Porto San Giorgio Grischuk finished 4th with 6.5/9. In November 1999, Grischuk scored 7/9 to share first place with Sergei Volkov at the Chigorin Memorial. He made four draws as reserve board at the European Team Championship held in Batumi then was knocked out of the Russian Championship in the quarterfinals by Alexei Bezgodov. Grischuk made his first Grandmaster norm in January 2000 at the Hotel Ubeda Open scoring 7/10 for 4th place then placed 4th at the Reykjavik Open, scoring 6.5/9. At the New York Open he finished 10th with 6.5/9. In June 2000, he won the Lausanne Young Masters, defeating Ruslan Ponomariov in the final. His success gave him his first appearance in the FIDE Top 100 at 78th, with 2606 and third top Junior in July 2000. Grischuk finished 4th on tiebreaks with 5/9 at the North Sea Cup. Now a Grandmaster, he finished third with 6/11 at the 4th Russian Cup Final in Elista and won the Torshavn International in October on tiebreak with Ponomariov. He claimed individual bronze medal for his second reserve board result at the Chess Olympiad in Istanbul. In the 2000 FIDE World Chess Championship, Grischuk reached the semifinals, losing to Alexei Shirov. In September 2001, Grischuk scored 4/6 at the inaugural Russia-Chess Summit. In January 2002, he finished second at his first Corus event with 8.5/13, half a point behind Evgeny Bareev. In the 2004 FIDE World Chess Championship he made it to the quarterfinals, where he lost 3−1 to eventual champion Rustam Kasimdzhanov. Grischuk finished in the top 10 in the 2005 FIDE World Cup, qualifying him for the 2007 Candidates Tournament in May–June 2007. He won his matches against Vladimir Malakhov (+2 −0 =3) and Sergei Rublevsky (tied at +1 −1 =4, winning the rapid playoff +2 −0 =1), to advance to the eight-player 2007 FIDE World Chess Championship. In that tournament he scored 5½ out of 14, placing last in the eight-player field. In 2009, Grischuk won the Russian Chess Championship. Later that year he won the Linares tournament on tiebreak over Vassily Ivanchuk after being invited as replacement for Veselin Topalov, who was in the Challenger's Match against Gata Kamsky. In 2010, he finished second to Topalov in Linares. Grischuk finished third in the 2008-10 FIDE Grand Prix, qualifying him as the first alternate for the Candidates Tournament of the 2012 World Chess Championship cycle. Upon the withdrawal of world No. 2 Magnus Carlsen from the candidates tournament, Grischuk was appointed to take his place. In the candidates tournament, Grischuk was seeded 6th out of eight players, and faced Levon Aronian in the first round. After splitting the four regular games 2–2, Grischuk won the rapid playoff 2½–1½ to advance to the semifinals, where he faced world No. 4 and former World Champion Vladimir Kramnik. Grischuk won the blitz playoff by 1½–½ to advance to the final, where he faced 2009 Chess World Cup winner Boris Gelfand for the right to play Viswanathan Anand for the World Championship. After five draws, Gelfand won the final game to win the match, 3½–2½. Grischuk played in the 2013 Candidates Tournament in London from 15 March to 1 April. He finished sixth, with a score of 6½/14 (+1=11-2). In November 2014 he took first place with 5½/7 at the Tashir Chess Tournament in memory of Tigran Petrosian in Moscow. This enabled him to cross the 2800 Elo rating mark. In July 2016, Grischuk won a four-game match against Ding Liren in Wenzhou, 2½–1½. In February 2017 Grischuk tied for first place with Maxime Vachier-Lagrave and Shakhriyar Mamedyarov in the first event of the FIDE Grand Prix series, held in Sharjah, UAE, taking first place on tiebreak. In July 2017, he beat Yu Yangyi 3–1 in the China-Russia Chess Grandmaster Summit Match held in Jiayuguan, China. In December, Grischuk won the men's Basque chess event of the IMSA Elite Mind Games in Huai'an, China. In 2006 Grischuk won the World Blitz Chess Championship in Rishon Lezion, Israel, with 10½/15. He won his second World Blitz Championship in 2012 in Astana, Kazakhstan, with 20 points out of 30 games. In October 2015, Grischuk won the World Blitz Championship for the third time in Berlin with a score of 15½/21, half a point ahead of Maxime Vachier-Lagrave and Vladimir Kramnik. Grischuk is married to Ukrainian chess grandmaster Natalia Zhukova. ^ "Men's Chess Olympiads: Alexander Grischuk". OlimpBase. Retrieved 1 January 2012. ^ "World Team 09 Russia takes gold; China silver". ChessBase. 2013-12-06. Retrieved 7 December 2013. ^ "The Week in Chess 104". theweekinchess.com. Retrieved 2018-01-06. ^ "The Week in Chess 110". theweekinchess.com. Retrieved 2018-01-06. ^ "The Week in Chess 169". theweekinchess.com. Retrieved 2018-01-06. ^ "The Week in Chess 193". theweekinchess.com. Retrieved 2018-01-06. ^ "The Week in Chess 196". theweekinchess.com. Retrieved 2018-01-06. ^ "The Week in Chess 209". theweekinchess.com. Retrieved 2018-01-06. ^ "The Week in Chess 219". theweekinchess.com. Retrieved 2018-01-06. ^ "The Week in Chess 221". theweekinchess.com. Retrieved 2018-01-06. ^ "The Week in Chess 229". theweekinchess.com. Retrieved 2018-01-06. ^ "The Week in Chess 247". theweekinchess.com. Retrieved 2018-01-06. ^ "The Week in Chess 251". theweekinchess.com. Retrieved 2018-01-06. ^ Kavalek, Lubomir (1999-11-29). "CHESS". Washington Post. ISSN 0190-8286. Retrieved 2018-01-05. ^ "The Week in Chess 262". theweekinchess.com. Retrieved 2018-01-06. ^ "The Week in Chess 265". theweekinchess.com. Retrieved 2018-01-06. ^ "The Week in Chess 268". theweekinchess.com. Retrieved 2018-01-06. ^ "The Week in Chess 273". theweekinchess.com. Retrieved 2018-01-06. ^ "The Week in Chess 284". theweekinchess.com. Retrieved 2018-01-06. ^ "The Week in Chess 288". theweekinchess.com. Retrieved 2018-01-06. ^ "The Week in Chess 291". theweekinchess.com. Retrieved 2018-01-05. ^ "The Week in Chess 295". theweekinchess.com. Retrieved 2018-01-06. ^ "The Week in Chess 297". theweekinchess.com. Retrieved 2018-01-06. ^ "The Week in Chess 304". theweekinchess.com. Retrieved 2018-01-06. ^ "The Week in Chess 310". theweekinchess.com. Retrieved 2018-01-06. ^ "The Week in Chess 314". theweekinchess.com. Retrieved 2018-01-06. ^ "The Week in Chess 318". theweekinchess.com. Retrieved 2018-01-06. ^ "All-time Tournaments - Tata Steel Chess". www.tatasteelchess.com. Retrieved 2018-01-05. ^ "Russian Championships Information 2009". Chess.co.uk. Archived from the original on 21 August 2011. Retrieved 1 April 2011. ^ "Alexander Grischuk wins the International TASHIR Chess Tournament in Memory of Tigran Petrosian". FIDE. Retrieved 27 November 2014. ^ "Petrosian Memorial, Rd. 7. Kramnik: "Grischuk is in brilliant shape"". chess-news.ru. 2014-11-11. Retrieved 2017-08-09. ^ Fischer, Johannes (2016-07-25). "Alexander Grischuk wins match against Ding Liren". Chess News. ChessBase. Retrieved 2017-08-09. ^ GU. "Alexander Grischuk wins Sharjah Grand Prix on tie-break". www.fide.com. Retrieved 2017-03-01. ^ "Alexander Grischuk wins FIDE Grand Prix in Sharjah". Russian Chess Federation. 2017-02-27. Retrieved 2017-03-01. ^ Silver, Albert (2017-02-28). "Grischuk wins Sharjah FIDE Grand Prix". Chess News. ChessBase. Retrieved 2017-03-01. ^ Liang, Ziming (2017-07-25). "Grischuk beats Yu 3-1 in Russia-China match". Chess News. ChessBase. Retrieved 2017-08-07. ^ McGourty, Colin (2017-07-25). "Grischuk storms to victory over Yu Yangyi". chess24.com. Retrieved 2017-08-07. ^ "2017 IMSA Elite Mind Games: Grischuk and Zhao Xue won Basque". FIDE. 2017-12-14. Retrieved 2018-01-07. ^ "Grischuk wins FIDE World Blitz Championship". ChessBase.com. 12 September 2006. Retrieved 19 May 2013. ^ "World Rapid and Blitz Championships 2012". The Week in Chess. 2012-07-10. Archived from the original on 15 October 2012. Retrieved 10 July 2012. Wikimedia Commons has media related to Alexander Grischuk. This page was last edited on 15 March 2019, at 05:00 (UTC).